For: Willpower, grounding , good luck. 6 mukhi rudraksha is ruled by Lord Kartikeya and pacifies planet Mars. 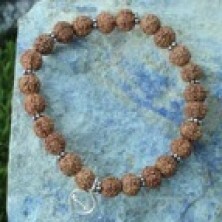 Gives willpower, grounding and focus and increases connection with mother earth. Wearer gets luck and assets of properties and vehicles. Wearing procedure: Wear from morning to evening for first 3 days to get the beads attuned to you. After that they start working as soon as the bracelet is put on. You may wear minimum 3-4 hours daily. On days you cannot wear keep in a clean place or pouch.